A two hour mountain bike ride, followed by a Spanish class, in which my teacher and I talked about boys in Spanglish–“ah, si, los hombres en Peru esten…” The day started perfectly. But, by the time I got back to my room, even after a long ride, I wasn’t hungry; in fact, the thought of food repulsed me. This isn’t normal. Eating after a ride is my favourite part. Something wasn’t right. I ate a few kernels of choclo corn–large corn kernels, and then tried to sleep. But there was a fight starting in my stomach. Then, the fight got vicious and turned into the kind of knocks to the gut that had me running to the bathroom– YADAYDAYDAYDYDA… you do not need this information, but suffice to say, I was in stage one of gastro nightmare. Dun dun dun. Show at 11! “Move?” Ahh, no. Paola and Tom, my house dad, draped me over their shoulders and down we went. Why was I on the third floor? A few times, with each new attack to the gut, I curled up on the steps, and started lamaze-style breathing. “Tranquillo, Mella, tranquillo,” said Tom. Eventually we got down to the main level, but there were two more flights to go, then head first into the cab onto Paola’s lap. I’ve never been more relieved for something to be over. Zoom, zoom, arrival to hospital. Wheeled in. But not before the last trip to the bathroom. “Oh Paola!” I moaned as that lovely woman held my hair back. “No shame, Melanie, no shame. I am your mom, no shame.” Oh, Paola. Shitting your pants in front of a person you only met a month ago, well, shame kinda goes out the window, now doesn’t it? Quickly shimmied onto the bed, and then the needles. Oh, my. I think the nurse confused me for a dart board. Seriously. Three needles for IV, and blood samples, but the worst: she didn’t think she found a vein, so instead of pulling it out, she wriggled the needle around in my arm. She might as well have pulled my vein out with her teeth, it would have felt better. Finally, the IV drip. It’s ironic that I was reading a story the other day about dehydration; if you pinch the back of your hand and the skin doesn’t return to its shape, you’re dehydrated. I tried it. My skin stuck; I had to push it back down. As we waited for the blood results, Paola kept coming into my room to pat my hair. By now, I was shivering and her warm hands were unbelievably comforting. Finally, the doctor arrives with the results: intestinal bacteria and urine infection. Apparently it’s been living in my body for two days. And, do I know what caused it? Anything from the water to fruit to … who knows. It also doesn’t help when the intense rainstorm hit. knocking out power and water supply to the homes, the water run off from farms and garbage merge into a giant bacteria party. I’m now on antibiotics for seven days. It’s been a few days since the incident, and I’m slowly recovering. Mostly it’s just getting back to eating solid foods and getting more energy. Soups and plain bread for the time being. I plan to bike around the city a bit today–nothing major–to get some energy back. But I am not alone: my housemate Laura got a bout of the tummy aches–without going to the hospital–a day after me, and my buddy Fran who was here also mentioned her stomach hasn’t felt quite right since returning to Canada. But, one thing is certain: I was with good people. If alone, I don’t know if I would have had the strength to get to the hospital. Thank you Paola and Tom. Thank you from the bottom of my slowly recovering tummy. Oh. my. god. Too freakin’ funny now that it’s over. It reminds me of when my ladyfriend picked up some intestinal bug in Morocco; she wrote on Facebook – “I brought something back from Morocco and it wasn’t dooty free.” Glad you were in good hands; yes, shitting your pants in front of anyone can be humiliating, but clearly you’re being taken care of. Get some rest and drink (bottled – despite myself) water! Glad you’re better. Bad stuff. Nice houseparents!!!! We are so grateful you have Paola and Tom to watch over you. 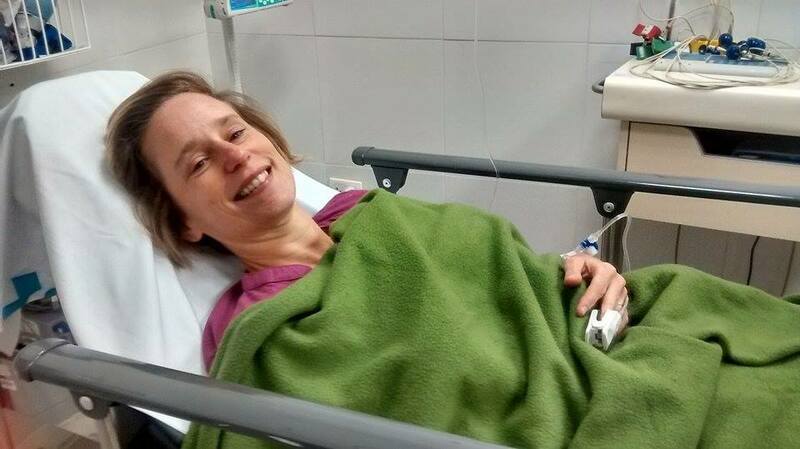 We hope you recover quickly and that this is the worst of your adventures in Peru. And thank you for telling us the awful along with the magic.